Rocked to sleep by the gentle river, and cacophony of sounds from the Nauta Caño jungle, the morning came quickly. I did not notice or feel the impending storm that the captain warned us about the day before. It must have passed overnight in my sleep. I got up and went to the observation deck to see the sunrise and do my tai chi. I missed the sunrise. The sky was gray with a subtle streak of blue to let the morning light. I had plenty of time to enjoy the scenery after tai chi, and before the bell ring for breakfast (The bell rings to signal that the dining room is open for breakfast, lunch or dinner). There was nobody around. I sat on deck alone staring at the swirling water when suddenly a large fish broke the water surface leaving large ripples. “Oh my God, it's true - a pink dolphin.” I thought with excitement like a kid on Christmas morning. We're supposed to have two excursions a day. Our itinerary showed hiking the surrounding jungle in the morning and fishing excursion in the afternoon on day-2. As with many things that were unpredictable in the Amazon, the sky was dark gray, hinting heavy rain. Vics had to adjust our schedule. After breakfast, the Turmalina was untied from the tree and sailed the Marañón River. Everyone gathered at the observation deck to relax, enjoy the light rain and the view. 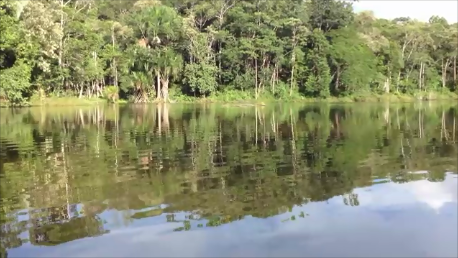 The expanse of brown water and the dense green of the rainforest rolled past our view. A few minutes later, the Turmalina reached the black water. It was then that Vics started talking about it. The black water is more common in the lowland forest like the Marañón River and its tributaries than the clear water of the Amazon. The black water has the color of black coffee. The color results from the discharge of tannins from the decaying leaves of adjoining vegetation. It is among the cleanest waters. Therefore, it inhibits the growth of parasites and the proliferation of insects like the mosquitos. As soon as Vics started talking why the fish thrives on black waters as if on cue, about a half dozen dolphins broke the surface to leave ripples that spread in ever-expanding circles. "They feed on the fish which flourish in these black waters. People believe the river dolphins are bad that's why they don't hunt them...They're a very good navigator. The dolphins are blind. They use sonar to navigate through the blackwater... 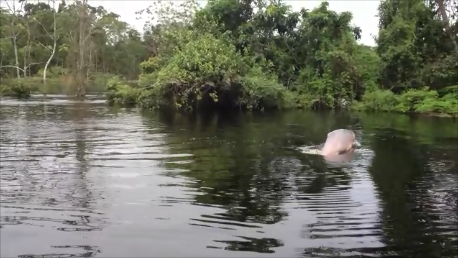 Pink river dolphins can also be found in the Yangtze River in China, the Ganges in India" explained Vics. He knows a lot about the Amazon and more, "Actually the Mississippi River used to have pink river dolphins too, but the pollution killed them off." Everyone pulled out their camera and began to snap away. “Wow, they're chasing you guys,” said Vics. I kept snapping away on the cavorting dolphins and tried to capture their elusive movement until I was all snapped-out, but we were off on the ensuing days to look for more. (Click on the thumbnail below to play video). Transitional Rainforest – a succession of trees like cecropia, Cena, muse and fox-growing trees. The fruit of the cecropia tree is the reason why/how they grow as if they’re grouped together. The seeds remain in dormancy for 70 years. The middle of the trunk is a hollow chamber to keep the ants busy during pollination. The cecropia tree is very slippery like soap. So people cut the tree up to use the branch as launching pad for canoes. The wild Cena trees have yellow flowers that are used to treat kidney ailments. The yellow flowers are a sign that the tree has been cut or deforested. Emergent trees that grow up to 240 feet. The whole process will take 100 years. The tallest tree in the Amazon is the Kapok tree or ceiba. The rain had stopped and the sky transformed from dark gray to azure blue after lunch. So we loaded up to the open boat once again for our afternoon excursion. We sailed the catamaran (which was basically two wooden boats put together) around the lake. Vics showed us the different plants, their properties and uses: iodine plant; pitsuayo (I wrote it as it sounded) – natural insect repellent; porcupine palm; aguaje palm – food for caracara. "The aguaje palm has lots of vitamin-A which gives the caracara their color. If cut open it has many grubs, lots of protein," explained Vics. Our lesson in Botany was interrupted by the appearance of macaws, vultures, caracara, and other colorful birds. As we went further into the inner part of the lake, we saw bats clinging to wooden sticks in the middle of the lake. Farther on, monkeys emerged from the thick stands of trees and out towards the flatness of the lake’s edge. Vics was very good at spotting monkeys. He made a sound to call the monkey while calling out for us to get our camera ready. “Oh look, guys, this is unbelievable!” called out Vics, sounding excited as if seeing these animals for the first time. “Dusky titi monkey, guys. Oh look, look, look..there are more crossing the vine. They’re tamarin monkeys.” Vics slowly repeating the name and type of animals, “Tamarin monkey, the second smallest monkey found in the Amazon guys.” The camera clicked as we vainly tried to capture the monkey as they leaped from branch to branch. I knew my iPhone4s had no micro-lens capability to capture the leaping tiny monkeys, but I kept snapping anyway and Vics kept asking, "Did you get it?" After seeing different plants and treated to seeing different types of monkeys, I realized how beautiful the scenery was beyond and within the lake. The exuberant landscape was fascinating, the reflections of towering trees and plants on the water were nothing short of painterly. We walked a short distance from the lake to the big river to board the open boat to transfer to the Turmalina. As we emerged from the path under the canopy of giant trees, I saw the sky as if painted in orange, blue and purple haze. The colors reflected on the water. The evening followed the same pattern: The colorful sky transformed into darkness, we retired for dinner. I thought I would go to the observation deck before heading off to bed. I sat on the deck to spend a few minutes in blackness and solitude to process and reflect on the day's sightings when I felt a sting on my right arm. I was bitten by a mosquito - a harsh reminder that we were in the Amazon jungle indeed. I added the footage of a jumping dolphin (up-close and personal) to the video. The video was taken from a different location.